A journey of fa. . . The lusty shouts of Bole so nihaaal, Sat Sri Akaal – the pausing for breath every 30 yards or so – a sip of glucose D water – mules and men jostling for space on a narrow rocky path, 15,000 ft up in the mountains – towering snow-clad peaks above and a gushing river below – scary to look up and scarier to look below. These are some of the sights and sounds experienced on the trek to Hemkund Sahib. Hemkund Sahib (lake of ice) is the glacial lake and gurudwara, high up in the Himalayas. The Sikhs believe it is the tapasthan (place of meditation and prayer) where Guru Gobind Singh, the tenth Guru, united with God in his previous incarnation. The people of the nearby valleys knew the lake as a place of pilgrimage, long before the Sikhs came. They called it Lokpal – the sanctity derived from its association with Vishnu who lived here and Laxman, the younger brother of Ram, who meditated and did penance there. Based on this, Sikh writers working on Guru Gobind’s life speculated about the location of Hemkund. Pundit Tara Singh Narotam, a nirmala scholar, wrote of Hemkund as one among the Sikh shrines in the Gur tirath Sangrah and Bhai Vir Singh developed the geographical idea of Hemkund in his work, the Sri Kalgidhar Chamatkar. In 1932, Sohan Singh, a granthi in a gurudwara in Tehri Garhwal, read Bhai Vir Singh’s description and found it so compelling that he resolved to search for the spot. Working from clues in the Bichitar Natak, the Mahabharata, and the books of Sikh writers, he reached Pandukeshwar in 1934 and asked the locals about the place where King Pandu did his penance. They said it could perhaps be Lokpal. He found the place where the Guru had meditated, published its discovery to the world, and built a gurudwara at the spot. Little would he know that it was to become a well-known site of Sikh pilgrimage. It was dark in the one-street village of Ghangaria, high up in the Himalayas, but already there was a bustle. Sherpa porters with faces wrinkled like stewed prunes, jerked large wicker baskets onto their backs, as per custom, the bells of the first mules tinkled, and hundreds of Sikh pilgrims, wearing bandanas with the ik onkar symbol poured out of the gurudwara into the pre-dawn darkness. Each carried a bamboo stick in one hand, and a jerry can in the other. “Bole so nihaaal,” cried one of them. His voice, like a warrior’s battle cry carried through the entire village and the Sikhs around responded with equal vigour, “ Sat Sri Akaal” and they were off on the climb to Hemkund. The trek from Ghangaria to Hemkund is six kilometres. The pathway, initially broad and gently sloping, followed the course of the Laxman Ganga river, which tumbled milky white over the rocks below. As we walked, the sun rose and filtered through the leaves dappling the ground. Through the breaks in the foliage, I glimpsed the peaks dusted white with snow, as though someone had dredged icing sugar on them. Then the path got steeper, and the panting for breath dominated over the admiration of beauty. Every switchback became a temptation to sit, pant for two minutes, and watch others going up. A frail old man, perhaps in his mid-70s paused for a minute, asked me the time, and flew on. The gold standard he was carrying said he had done the journey on bicycle from Ludhiana. As I sat wondering what made him, and others like him attempt this arduous trek, the line I had read earlier on a website came back to me – “Sikh pilgrims go there inspired to walk the same difficult path that the guru walked,” wrote the author and it made sense. The path got even steeper and narrower. Mules on their way down now jostled for space with the pilgrims. Some of them pushed you to the edge and it was scary to think that one small slip would send me to the river, a thousand feet below. The Sikhs on their way down stopped those going up at regular intervals, and handed out Glucose D, but as we climbed, breathing became more difficult. Finally, after five hours of climbing, a waterfall and a set of dizzying stone steps came into view. Atop the steps was the Nishaan Sahib of Hemkund. Hemkund Sahib is a place of raw grandeur, built for meditation. Behind the Nishaan Sahib, the land dipped again towards the gurudwara and the lake. All around were the towering snow clad peaks of the Sapt Shring, as still and beautiful as in a photograph. 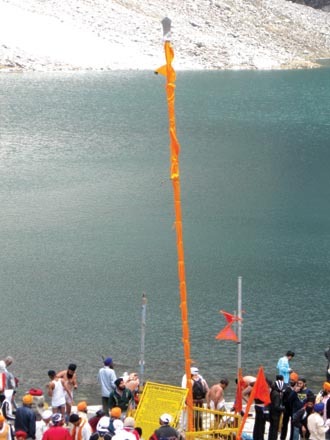 They hemmed in the lake whose shore ran from the gurudwara at one end to the edges of the mountains at the other. Just below the peaks, glaciers like long white tongues, stretched to the lake’s edge and fed its waters, smooth, and clear as glass. Cold winds blew down the slopes and cut across the surface of the lake creating silver ripples on the surface. As I watched, a group of Sikhs undressed and took a dip in the freezing water, while a few others collected it in their jerry cans. One of them pointed to the peaks and I followed his fingers with mine to see seven Nishaan Sahibs – one atop each of the Sapt Shring, like thin pencils fluttering in the icy winds. (I was told, they were planted afresh every year) The wind froze my fingers and made me hurry towards the gurudwara. 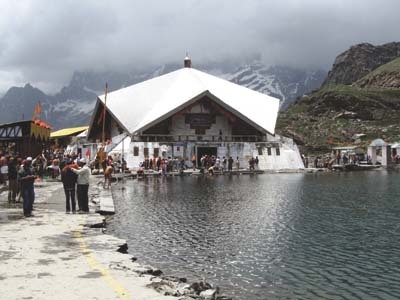 The gurudwara at Hemkund is a star-shaped, two-tiered structure that stands at one end of the lake. It commemorates the spot where the guru was first commanded by God to be reborn in this world and teach men the true path. On the top deck was a large hall, where under a gold canopy lit with flashing fairy lights, was the holy Granth Sahib. Rows and rows of Sikhs wrapped in blankets sat on a thickly carpeted wooden floor in front of it. Some of them nodded into their prayer books, a few others hummed a shabad, more to keep awake than out of piety, while others at the back had fallen asleep out of sheer exhaustion and the warmth of the place. All of them awaited the ardas at 2 pm. 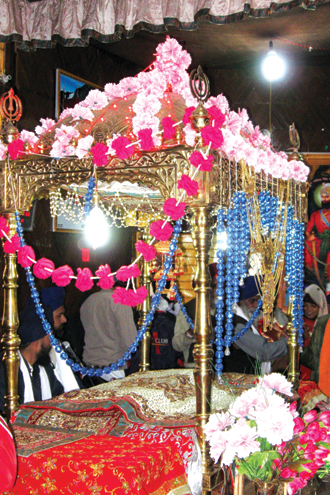 The ardas was a sort of grand finale to the entire pilgrimage and a symbolic participation, in Guru Gobind’s life in Hemkund. The granthi took the microphone and explained the significance of their darshan and ishnan. He recounted the story of Hemkund as it was told in the Bichitar Natak and said a little about Guru Gobind’s life. Then he started a chant and the rows of white and orange turbans chorused. Every so often, he stopped and the Sikhs erupted into shouts of wahe guru. The reading of the Hukumnama again, signalled the end and a young Sikh boy went around the hall doling out mouth-watering karah prasad. A line formed and the pilgrims went up and prostrated to the Granth Sahib. They did a parikrama and presented the rumalas they had brought to the granthi. Just at that moment, he took the mike again, cautioned us about the deteriorating weather and darkness, and requested us to leave. As I rested on the way down, the old Sikh I had seen on the way up breezed past again carrying a large jerry can of water. He was as fresh as a daisy. I felt ashamed, and wondered what powered him so effortlessly. “We pour a drop into our carburettors every day, phir gaddi chalayenge,” said a group of Sikh truck drivers when I asked them why they were collecting the water of the lake. Faintly amusing and rustic, the answer nevertheless offered a clue to their beliefs and the energy of the old Sikh. Hemkund is a journey of faith.